After my much hit “Underbelly character guide”, I kept thinking I needed to write something about the new Underbelly series, and I kept thinking that I really needed to write something about the series. But since it finished last night, I’ve realised the reason I really wasn’t compelled to write much. It just wasn’t that good. Not good at all! It suffered from a lot of problems. While I think it was generally well-acted and well made, there were a lot of poor choices in the writing and dramatic structure, and I really think the whole historical period they selected just wasn’t dramatic enough — or to be precise, not dramatic in the same way or to the same degree as the first series. They were then forced to fictionalise a lot of it (and I mean very large parts of it, not just smaller elements like the first series likely would have), which is a bad thing, especially if you’ve read anything about the real history like I have (for instance, did you know the last episode zipped through about five years of history… you certainly wouldn’t have known it by watching it). Then to top it all off, it the second half of the series ended up being set in the same period as one of the best dramas ever made in Australia, Blue Murder. Buy it and watch it if you haven’t — that’s the definitive telling of NSW crime in the early ’80s. And to escape that legacy, Underbelly 2 ended up being full of holes, no Mick Drury shooting (likely Chris Flannery’s most notorious crime), no sign of Roger Rogerson (well, I do think that Samuel Johnson was playing a lamely fictionalised version of him — Jack Smith anyone?? — but that just made it worse) and no sign of Neddy Smith (unless he was an extra on the boat when Brian Alexander got thrown off). This is all very well and good I suppose, but I guess the wider audience may have enjoyed it anyway, not knowing a lot about the history and just watching an exciting yarn. But I don’t think it was even that exciting really. There was no real dramatic centre to it — too many disparate stories told haphazardly. The first series worked because it was about a specific group of people over a specific amount of time. It was a gang war between two groups of characters … a clear dramatic focus that made it work, with plenty of personal conflict. And it was largely accurate, with the fictionalising coming mostly in individual scenes, not from large chunks of the story. This time, the character focus wasn’t even there. I don’t think Terry Clark was anywhere nearly as interesting as they wanted us to think, and his parade of girlfriends just came off as silly girls (not one of them had the character of Roberta Williams, that’s for sure!) Flannery was a caricature (see Gary Sweet in Blue Murder for the better version), and earlier Melbourne stories barely had any time to be noticed, and certainly no focus (why even include those stories? That’s the haphazard nature of the drama right there). Robert Trimbole was probably the most interesting character in the whole thing, but even his story petered out. There are so many reasons why this new series was disappointing, especially compared to the right choices made in the first series. But it rated through the roof anyway, and we know there will be an Underbelly 3. And I can already tell them what they should cover, especially if they want to avoid the mistakes of series 2. Melbourne, between 1986 and 1989 — a crazy time where the police had declared open season on crims, starting after the Russell Street Bombing in 1986 (that’s your opening dramatic incident right there). After this, police went a bit nuts and started shooting criminals at every opportunity, while bank robbers operated constantly anyway. Plenty of bank robbery action, and plenty of shootouts. Bring back the Victorian police from season 2, drop them in the new story. Biggest incident is after the shooting of Russell Jensen in dubious circumstances in 1988, two young cops were murdered days later as revenge. The hunt for the perpetrators, the gangland infighting, the police investigation. You’ve got it all there — a shorter span of time, several big dramatic incidents, major characters, one major dramatic drive for the whole series, significant and known history that you don’t have to fake, and a specific way to end it as well. Plus links to both Underbelly series 2 and 1 (one of the crims aquitted of murder of the two cops was a player in Underbelly 1). Channel Nine, I await your next move, if you are to improve on this year’s attempt. 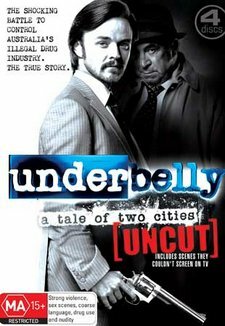 Underbelly: A Tale of Two Cities — 5 out of 10.